Hi There and welcome to our website!!!! Our Race this year is August 24th in Rock Springs, WY. 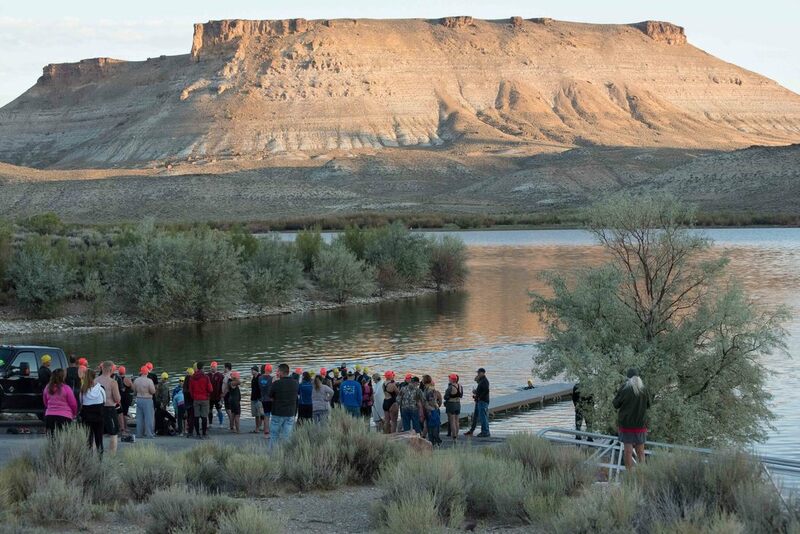 The Race will be held at the Flaming Gorge National Recreation Area. We will have an open water swim which is going to be wet suit legal with a mass start. We will once again host a Sprint Race, an Olympic Distance race, A youth race, a Duathlon ( run, bike, run), the Aquabike and new this year is the Aquathlon (swim and run). We will have Athena and Clydesdale racer options. We are right now working with the state to see if it might be possible for us to introduce the 70.3 distance race. Updates will be made as we find out more. We will do mass swim starts at 7:00am for Long Distance and Olympic Racers, 7:05am for Sprint Racers, 7:15am for Aquabike/Aquathlon, a 7:20am start for Youth Races and a 7:30 start for the Duathlon. This race has something for everyone!!! Whatever your race is, we have it! Costs: Keep your eye on our Race on the Rock Facebook Page for up to date information. Hi there and welcome to the Race on the Rock. We are in our sixth year as a USAT certified event. Make sure you like our page on Facebook for updates. This race is a high altitude race, the average altitude is about 6300ft. This adds to the difficulty of the race for those not used to training at high altitudes. We are at the top of the Rockies, in the desert plateau, that means our humidity is low, the air is a bit thin, and the temperatures at the start of the race will be somewhere in the 50's. So you can expect the air to be crisp and cool the morning of the race. It will warm up into the 80's generally by late afternoon. Most racers should finish the race before temperatures are out of the 70s. The transition area is the boat ramp parking area. The National Parks Service is allowing us to shut down half of the boat ramp area as well as the road leading in and out of the gorge from Hwy 191. This will mean a closed road for the Olympic, Sprint, and youth distance races. After the race we will have refreshments, music, and eventually awards. Everyone who signs up gets a race t-shirt and a goodie bag. Those who cross the finish line will get the finisher's medal. We have prizes then for the top time finishers and sometimes everyone else as well. For those who might be coming in from outside of the local area the directions are simple, take Exit 99 off I-80 and turn south. At the 13 mile mark Look for the sign pointing to the Flaming Gorge at Firehole. There is free camping at the start/transition/finish area. Reservations are helpful though and there may be a fee for your vehicle, but contact the Ashley National Forest for information on the campsites at: 435-781-5281 Make sure you specify that this is camping for Firehole, in Wyoming. We will have packet pick up at the Bike and Trike the night before the race, 612 Broadway in Rock Springs. Generally packet pick up starts at 4pm - 530pm. The Wild Horse Loop: Up on White Mountain there is a herd of Wild Mustang Horses. As you drive along the top of the mountain you could come face to face with some of the herd. On top of that mountain as well is Pilot Butte, a prehistoric volcano. It used to be used for navigation from the Oregon Trail to when pilots first took to the skies. Western Wyoming Community College: There are a number of dinosaurs throughout the college. Casts of actual bones found locally have been made and are assembled throughout the college including the T-Rex, the walking tour guide is right at the front desk when you walk in. We also have a museum of wild animals as well on campus. Lots of things to see and do while there. Grand Tetons and Yellowstone: if you want to make the race part of a vacation the Grand Teton National Park and of course Yellowstone are only about 3 -4 hours north of the race site. Shopping, movies, food: We have plenty of shopping opportunities, a movie theater, and lots of restaurants for anyone's tastes. If you need suggestions just let me know. If you are looking for white water rafting you can either go north to Jackson or there is a great trip south of the race site in Vernal, UT through Adrift Rafting. All participants will be required to sign a USAT waiver for participation, which will be provided to you at check in. misunderstandings on race day, I hope you will take the time to read the following summary of the Position Violations, which you know as the drafting rules. · Ride on the right side of your lane. · Complete your pass within 15 seconds. · If passed, you must drop completely out of the zone, to the rear, before attempting to re-pass. · Position– riding on the left side of the lane without passing. · Illegal Pass – passing on the right. · Drafting – following a leading cyclist closer than three bike lengths and failing to pass within 15 seconds. for three violations, you will be disqualified. Be sure to check the penalty sheet before you leave the race site. helmet in a different country it might be illegal for use in sanctioned events. follow, so don’t forget – that’s a DQ! Wear your race numbers, don’t leave your trash on the course, and don’t carry or use any portable audio devices. Remember to treat other athletes, volunteers, and officials with courtesy and consideration. Failure to do so is called Unsportsmanlike Conduct and you will be disqualified. 1. Do I have to wear a helmet? Absolutely. And it must have a CPSC sticker. Buckle your helmet anytime you are on your bike. You will be disqualified if you are on your bike without your helmet buckled anywhere on the course. If you are in transition, you will be assessed a variable time penalty. 2. Why do I need bar end plugs? So you don't give yourself or someone else a nasty biopsy. Not having openings on your bike solidly plugged is a DQ! 3. Do I need to wear my number? Your bike number must not be altered and must be visibly displayed on your bike. You only need to wear your number when you are on the run. 4. How far to the right must I ride? Stay as far to the right as possible, but generally about the width of a standard bike lane – about a meter. Pass on the left, then return to the right. 5. Can I pass on the right? No, pass on the left. If someone is blocking you, ask (loudly!) this person to move to the right, so that you may pass. 6. What is the draft zone? The draft zone is a rectangular area 7 meters long and 2 meters wide around each bike and 30 meters behind and 15 meters next to a moving motor vehicle. As a practical guide, keep 3 bike lengths between you and the biker ahead of you. You must complete your pass within 15 seconds, and once you enter the draft zone, you must exit from the front, so be confident of your pass. 7. If I'm passed, do I have to wait 15 seconds before I can re-pass? No, but you must drop back completely out of the draft zone. Do not attempt to "catch up" by getting up out of the saddle, and pedaling fast. You will be called for an overtaken penalty. 8. Can I ride in transition? If there is a mount/dismount line you must observe it. 9. Can I drop my water bottle or gel packs anywhere? No. Toss trash in a receptacle, or in the drop zone within sight of an aid station, or you may be cited for abandoned equipment. 10. Can I accept help? Only accept help from race organizers or official volunteers. Accepting it from others is considered unauthorized assistance, and you may be penalized. 11. Can I put my bike anywhere I want? No. Rack your bike and put all of your gear in the space race management has designated for you. Rack with your “wheel down” on the side of your assigned space. If you hang it by the handlebars, then your rear wheel will be on the ground on the side of your number. If you hang it by the seat, the front wheel must be on the same side as the number. 12. What if I go off course? You must re-enter the course at the same spot you left it. 1. May I wear my head set ? No. Head sets, radios, head phones and personal audio devices are prohibited. 2. Can someone pace me? No. Pacing is illegal. You may have someone provide you with split times. 3. Do I have to wear a number? Yes, you must wear your number. 4. May I carry my own water bottle? Yes, but it must not be a glass container. Rules, please visit: www.usatriathlon.org, click on Events, then Rules.